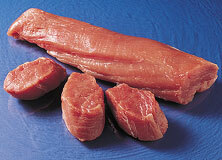 Pork tenderloin - the other white meat that will become a staple in your refrigerator. Serve it whole and carve it at the dinner table, slice the meat and serve as a party hors d'ourve, or cut into strips to top a salad. Very versatile, yet moist and delicious. According to the National Pork Board: Description: The tenderloin comes from the full pork loin. As the name indicates, the tenderloin is one of the most tender cuts of pork. Typically, one piece weighs between ¾ and 1 ½ pounds. Pork tenderloin makes an elegant entrée for a small dinner party but also can be roasted or grilled whole for quick weeknight dinner. When sliced crosswise (like a loaf of French bread), the resulting medallions also may be sautéed. This cut of meat has a mild flavor, so it’s best when prepared with an added spice rub, marinade, stuffing or flavorful sauce. To keep the tenderloin juicy, be careful not to overcook it.